For deep chronic pain of the bones, joints, or muscles, Bone Magic's specialized herbs draw out the inflammation. Then the herb Comfrey ("Knit Bone") speeds the growth of cells to "knit together" and repair broken bone, torn muscle, torn ligaments, and damaged tissues. Bone Magic should be used in combination with All Natural Mountain Magic Liniment, because the small celled Liniment goes down fast into the blood stream pulling the heavier Bone Magic down with it. Although "Bone Magic" is used often for bones and joints, it also works well for many injuries to muscles and things such as varicose veins, TMJ, earaches, arthritis, eczema, psoriasis, sore feet, carbuncles, and bone spurs. 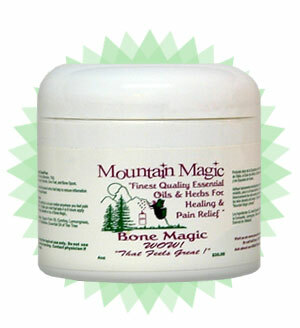 We suggest rubbing Bone Magic on the painful area first, then applying All Natural Mountain Magic Liniment on top. People suffering from chronic pain involving inflammation and/or tissue damage, say they get the greatest pain relief and improvement using these two products together. All Natural Mountain Magic Liniment with all of those 12 essential oils, the very important MSM, and the 3 carrier oils help to pull the Bone Magic down into the damaged area, while the Liniment's essential oils increase circulation, relax muscles, decrease toxins, bacteria & fungus, and give pain relief for 4-6 hours. All Natural Mountain Magic Liniment Learn more info about how the Comfrey in Bone Magic actually works. Bone Magic contains no artificial chemicals, petroleum products or animal products.